LANDER Simulation & Training Solutions specialises in the design, manufacture and installation of commercial railway simulators to be used for training purposes. As well as producing complete training simulators designed for the railway industry, we also design instruction processes to deliver an all-round tool that realistically simulates potentially critical situations with which a railway equipment operator or driver could be faced when going about their everyday activities. These situations would be extremely difficult to reproduce in any other way. Our aim is to produce safe and productive road-based and railway simulation operations. 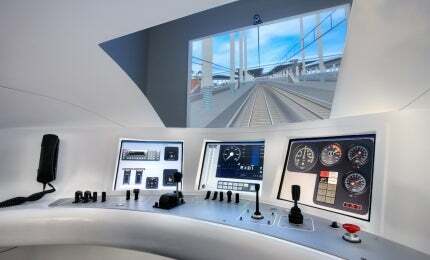 LANDER’s simulation projects strongly focus on the educational needs of simulator users at a virtual train. Our simulators also focus on human risk and error analysis, and the technical and functional characteristics of each train or tramcar simulator. Each train simulator is specifically designed to meet its user’s specific needs, according to identified present and future educational requirements. LANDER supplies a range of training courses for instructors, teaching them how to use the railway simulator. By training the instructors, LANDER ensures that you will get the most out of the simulation tool. Our train simulation products undergo continuous improvements thanks to the truck, underground drill rig, tramcar and train simulators set up at our installations for R&D purposes. LANDER provides total turnkey solutions for our simulation-based training systems. We aim to take care of the entire process, from design to installation. Once the simulation-based training system has been developed according to customer requirements, it has to be installed in the place designated by the client. To do this as easily, rapidly and efficiently as possible, LANDER ensures that its designs do not depend on clients having any special infrastructure. The only resources required by the training system are electrical and communications (voice and data) connections. We also work hand-in-hand with our clients to create simulation rooms. Once the train simulator system has been installed and following its period of guarantee, LANDER offers innovating maintenance alternatives for preventing both loss of time through breakdown and early obsolescence. We offer a variety of maintenance options depending on the required response time, including immediate assistance via remote connections and the possibility of keeping a stock of specific spare parts for each client. The most innovative feature of the LANDER maintenance concept is the idea of the client being independent from our company. We avoid maintenance contracts strangling simulator users and linking them permanently to LANDER; on the contrary, we want users to make autonomous use of the simulator and achieve zero maintenance costs. Thanks to its structure and make-up, LANDER offers the simulation world last-generation simulation systems for new and better training standards, improving performance of training and extending its scope. This achievement is possible as a result of the work of the staff of LANDER and its main shareholders and development partners: CAF, CEIT and ESM. Trams have recently been steadily reestablishing their prominence across new cities that require a boost to public transport, as well as being strengthened in capital cities where they are a key part of local life. Lander Simulation & Training Solutions is a company specialised in the design, development and installation of state-of-the-art commercial simulation devices aimed at training. Track to Safety is a pioneering gaming experience that allows train drivers to reinforce their knowledge and transform their attitudes. Last 18 January was an important day for the province of Utrecht. Tram operator QBuzz and the municipality of Utrecht celebrated an event that highlighted the commitment of both bodies to excellence in transport, sustainability and above all, their commitment to safety. This week LANDER has completed the installation of a complete simulation classroom to provide training in the operation of the first Driverless Metro in Latin America. Lander presented the simulation equipment it has been developing with JMS, a training academy for drivers in Krakow, at a technical seminar last Friday. The information we have about the human brain has been significantly increased thanks to the development of new brain visualisation techniques. At Lander Simulation & Training Solutions, we are continuing to work on graphics to ensure that our simulators offer the best possible quality. In this regard, one of our in-house development teams has been working on a new visual system that will enable new simulators to provide a more realistic and immersive experience. In recent years, training methods for workers have diversified enormously. The heads of human resources and training at companies are making huge efforts to include innovative systems in their training processes. The advances made in new simulation technology in recent years have meant that these cutting-edge techniques can nowadays be applied effectively within the fields of training and health and safety. In recent years Lander has continued its development in simulation technology and at Innotrans 2012 is set to present its tram simulator.